What auto body repairs can you do on your own? How do you find the best auto body repair shop in Reno? How do you keep your car in tip top shape to avoid visits to an auto body repair shop? At Liberty Collision, we have the answers for you. Make sure you have your tools ready for your DIY auto body repairs in Reno. There are some small auto body repairs you can pull off on your own, and there are some you should definitely leave to the professionals. Simple DIY auto body repairs include minor car scratch repair and replacing a broken headlight or tail light. You can even try your hand at DIY dent repair on small dents and dings. If you try to repair car scratches, make sure the scratched area is not already rusting. If so, visit your auto body repair shop in Reno! The DIY movement is supported by lots of DIY auto body repair kits available in stores and online. 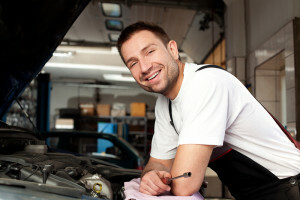 If you are performing a DIY auto body repair, make sure you have your car in a cool, dry place. If you are working with chemicals of any kind, make sure there is some airflow. If you have been in an auto accident, visit an auto body repair shop in Reno to make sure your car is alright. You could emerge from a fender bender with a car ding here or there, but seemingly cosmetic car damage can affect your car in other ways. Dents and dings can affect the sensors in your car that determine when to release the airbags in a collision. A dent in a fender can cause problems with the sensors that put you in danger. If you have a collision while driving a car that is not in optimal condition, you could cause more harm to you and others in your car in the event of an accident. Give yourself the peace of mind by visiting an auto body repair shop in Reno to make sure your car is in good condition. After a car collision, you have to deal with the auto insurance company. 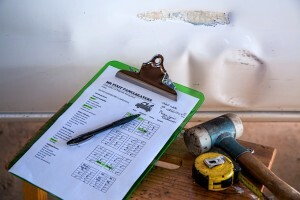 Auto insurance companies will give you a list of auto body repair shops in Reno that they know. Many people believe the Auto Body Repair Myth that you have to go to the auto body repair shop the insurance company lists. This is simply not true. You as the vehicle owner can choose any auto body repair shop in Reno you want. At Liberty Collision, we are ready to be your go-to auto body repair shop in Reno. Choose Liberty Collision as your auto body repair shop in Reno. Our auto body repair team at Liberty Collision performs safe and efficient car repairs. We continue to strive for excellence and find ways to get you back on the road safely. Our auto body repair shop in Reno holds an I-CAR Platinum Certificate of Recognition for Achieving a High Level of Technical Training and the Ford Motor Company Customer Service Silver Medallion Award. We also use an auto body repair computer called ALLDATA to verify manufacturer requirements and provide safe repairs. Stop by Liberty Collision or call us today for your next auto body repair in Reno!